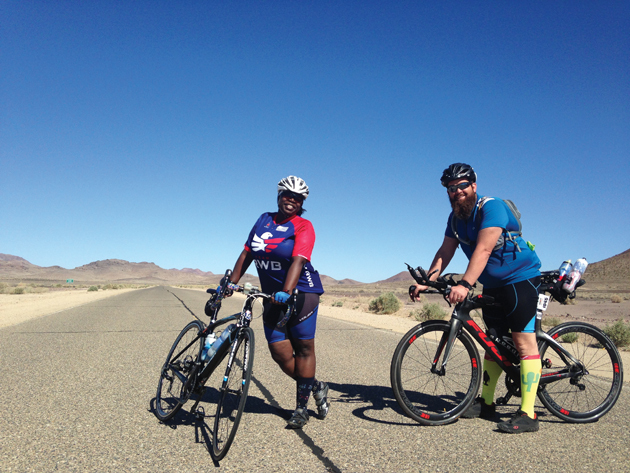 Cyclists Maj. Kim Dortelus (left) and Sean Bannon (right) train at Fort Irwin as part of the local chapter of Team Red, White and Blue. They say they enjoy the mental and physical challenge of endurance sports. FORT IRWIN, Calif. — Maj. Kim Dortelus remembers the first big hill she encountered as a new cyclist. “I looked at it, and I didn’t even try to ride up it. I walked,” she said, laughing. She was working in Texas at the time and, as a registered nurse, had started riding bikes along with patients who were healing from post-traumatic stress disorder. Within six months she conquered that hill. 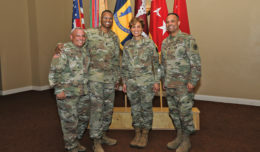 Now, stationed at Fort Irwin’s Weed Army Community Hospital, she looks forward to the challenging climbs on her rides. On the Saturday morning before Fort Irwin’s Tour de Irwin bike race, Dortelus was out for a ride with fellow cyclists Sean Bannon and Capt. David Crews. The race is an annual event hosted by Outdoor Recreation, with three distance categories ranging from 2.5 to 40 miles. 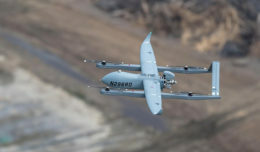 Heading west from Fort Irwin, the route passes NASA’s Goldstone Deep Space Communications Complex, winds through low mountains, and drops into a vast dry lake. The way is riddled with the oddities common to the desert – giant boulders painted with eyes and teeth, a “Beware of Sharks” sign next to a metal fin bolted into the cracked dirt, even a sinuous metal sculpture of Nessie rising from the dry lake bed. Dortelus, Bannon and Crews have competed in cycling races and even full-length triathlons. But while they train regularly and work with coaches to track their progress, they say the real draw isn’t competing or winning – it’s seeing how much they are capable of doing. Dortelus agreed. She said she doesn’t pay attention if other riders pass her on hills or if she has to slow down occasionally. Her advice? Just keep pedaling. Dortelus, Bannon and Crews are all part of Team Red, White & Blue, a nonprofit organization that connects veterans and their families through physical and social activities. The Fort Irwin chapter hosts regular cycling rides and has started a triathlon training program.